I am excited and looking forward to returning to this 50 mile night time run after having to miss it last year while I was out in Wyoming. This of course is one of the MTC events and is always a lot of fun despite the heat and hills. I made my debut in 2005 and actually just ran the marathon in the first year that Doug had added it as an option. I ran it with Karla, our 2nd together as I had just began training with her. It was tough and my slowest marathon to date. However I must mention I had just raced 41miles in an 8hr overnight run the week before ! 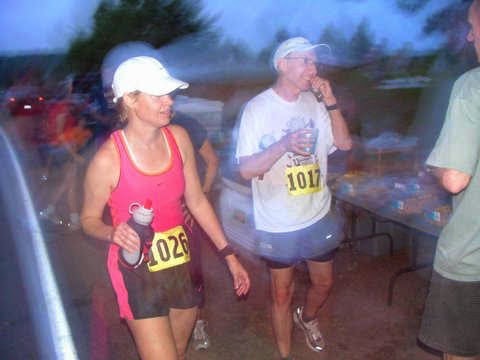 I returned in 2006 for the 50 miler and despite having run the Old dominion 100 miler 2 weeks before I actually ran fairly well just taking it easy finishing in 11:03. In 2007 I had to skip running since I had Western States coming up 2 weeks later but went and volunteered. I returned in 2008 but I was really banged up that year with nagging injuries and was forced to drop after just 10 miles barely making it up Bethel Church Hill my legs were in such pain. I came back again as a volunteer in 2009. After finally taking off a month to heal the previous December I was in a re-building mode and cross-training and had my first Ironman coming up a week later. After the Ironman I was ready to re-focus on running and was excited to return to Boogie in 2010 ready to race. Well, it turned out to be one of the hottest ever with about 97F at the start. A slow miserable 11:32 that had me wandering to myself at mile 30 as to whether I was really wanting to be an ultra runner again. I decided I did and went back out and actually felt better the last lap. By 2011 I was much stronger again and running well and set my course pr of 10:46 on a fun night including an epic thunderstorm. And then the madness of 2012. I surprised everyone with my plan to do a double Boogie, the first Boogie 100. I started at 6am with my then training partner Amy and within the first 1.5 miles we were attacked viciously by the dogs. We continued on after the attack and Amy left after 26miles and I continued on but was forced to drop after 62 miles and go to the hospital. And then I had to skip last year of course as I mentioned due to the Bighorn 100 out in Wyoming. And that brings us to this year. I am in great shape and looking forward to giving my course record a beating ! But although I seem to be running well and recovering nicely, it has only been 3 weeks since the 72 hour race and the 211 miles . I have been running well with almost normal mileage but I'm sure it will be well into the 50 before I find out if or how much lingering fatigue there may be. And my feet are still a long ways from being back to normal and I just hope they hold up ok.